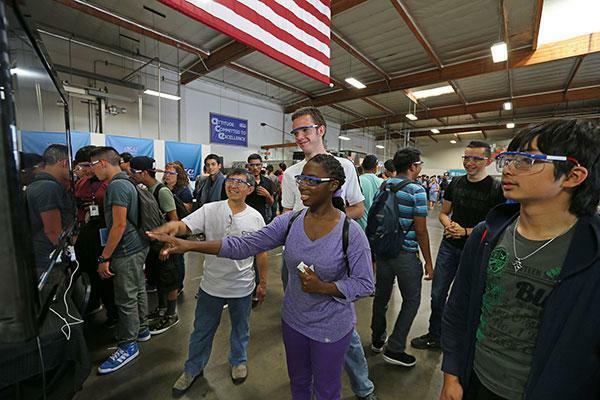 There are 49 manufacturing events already registered in California for the National Association of Manufacturers' MFGDay on October 5, 2018. We need to hit 150 to show California's manufacturing chops in 2018. Here are some some things you can do to make your MFG Day a success. One of the most important things to do is to establish a connection with your guests. Those few hours you spend with them are your chance to communicate the importance of what you do — and the creativity, advanced skills and technology required to do it. Ideally, your passion will spark something similar in the young people who you introduce to manufacturing, inspiring them to learn more about the industry and one day join the manufacturing team. Follow these seven rules of thumb to improve your chances of connecting with your guests and inspire the next generation of modern manufacturers. In planning a good tour — especially when the intended audience members are primarily people with no manufacturing background — you have to start by creating a story of your company that anyone could understand. What do you make? Who buys your products? Keep explanations simple and free of industry jargon. Think storytelling with illustrations rather than textbooks packed with pages of small print. The quickest way to lose the interest of your visitors is to try to show every bit of minutiae. Pick a few stops that represent key stages in the production process and allow you to demonstrate the progress a product makes through the shop. What are the best places in the plant to give an overview of the production process and highlight the work of your people and machinery? Where will visitors get the best view? Can they hear you? Which of your team members are the most enthusiastic about their work and comfortable explaining what they do and why it is important to the process and the company? These considerations should guide you in planning the tour. Of course you can’t allow visitors to get up close and personal with your machinery, but you could create a display that illustrates what a product looks like in various stages of completion, where they could be allowed to pick up and hold something they’ve seen made. No clutter, everything in its place, floors swept clean, a path through the shop is easy to follow. Remember that part of the reason to invite visitors to Manufacturing Day events is to prove that manufacturing facilities are great places to work. First impressions count: What does your company look like as visitors approach from the parking lot? Let’s dispel the myths that manufacturing is dark, dirty and dangerous. Also, make sure employees are dressed neat and clean on tour day and if they have a role to play in explaining things to your visitors, they should be wearing a name badge so that they can be addressed by name when there are questions. Students are the workforce of the future. This is your opportunity to provide advice about the kinds of careers that your company offers, the type of training and educational coursework you seek when hiring employees. There is no better time to offer comments about opportunities available to dedicated workers with a professional attitude. If there are specific kinds of training or skills that you need and find it hard to hire for, let them know. This is important both literally and figuratively. Put a sign on the door, shake hands with visitors, thank them for coming, and demonstrate your enthusiasm for the opportunity you have to share your company’s information with them. The families of your employees. If family events aren’t a common occurrence at your company, this is a perfect day to invite families to come and see where their family member works and learn what they do. Maybe you could do a special event just for family members at the end of the workday. Your elected officials. Ever complain about the fact that your elected officials (local, state, federal) don’t make good choices as related to manufacturing? Invite them to come to your plant and see for themselves. Remember: Most elected officials have never set foot inside a manufacturing facility, which means you can educate them! Potential customers. Give these folks a reason to want to do business with you. Invite them in on a day when they can see how great your organization is. Current customers. Make Manufacturing Day your customer appreciation day. Your business service providers. When was the last time you were visited by your banker, insurance agent or accountant? Media. Is there a local reporter who seems to have a serious interest in manufacturing? Invite them to visit your plant on Manufacturing Day. They are always looking for interesting stories to tell. Why not make it yours? Youth organizations. Are you active in, or do you know someone who is active in the Boy Scouts, Girl Scouts or a similar youth organization? Invite them to visit your company as a field trip. Better yet, invite a school group.